$30.00 for each additional student. Maximum class size is 25 students. Please note: Students pay a fee for the required class pattern or Binding class kit. * Plus all travel expenses, meals & lodging, additional luggage charges, shipping where applicable. All fees listed above valid for any workshops upon contract signing, no matter the future date. My Brochure: Click HERE to download a PDF copy. 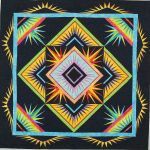 All patterns, designs and quilts are copyrighted © and cannot be reproduced, copied or used without prior permission. Ready to get over your fear of scrumptious, sharp points and graceful curves? Stop right there! These are the workshops for you! *Setting curves perfectly & painlessly! These classes do come with one warning though... 'spikey' quilts can be very addictive! So...be prepared to laugh a lot, have fun with your fabrics and embrace the fun of making our not so basic NY Beauty quilts! Full or Half day workshop. 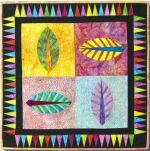 This is a perfect workshop for anyone wanting learn the basics of paper piecing, or just hone up on their current skills. Students learn how to measure a pattern to determine the size to cut fabric; paper piecing techniques, and how to set curves (without fear). 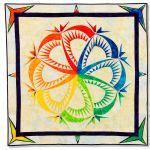 'Harvest Moon' Is an incredible little quilt, designed to find you inner 'Zen'. 'Midnight in the Forest is a delightful little wall hanging, guaranteed to put a smile on everyone's face! Click for Supply List, Fabric Requirements, and a Nifty Drawing that you can print and color! This bright and fun quilt is perfect for the wall or even a baby quilt! Click for printable version of Ringo Star's supply list. This charming little quilt is the perfect project for perfecting your points and curves. These adorable little stylized leaves are a treat to make a and feast for the eye. 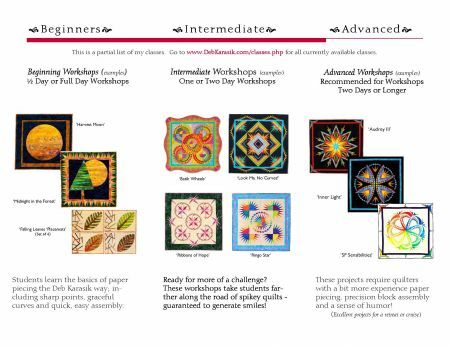 These workshops introduce the students to several variations that can be utilized with spikes, creating beautiful quilts. Students in these workshops will learn how to stretch their imagination to incorporate different color combinations and spikes that go beyond the basic NY Beauty. This delicious wall hanging is the perfect project for all of those fat quarters you've been accumulating! Terrified of those pesky curves? Although this quilt was designed for a Breast Cancer Fundraiser, it's a charming quilt that looks amazing no matter what colors you choose! In these workshops, students will explore an entirely new way to see 'spikey' quilts. Multiple layers and rows of spikes will challenge students into letting their creative juices really flow. Is the perfect wallhanging for learning the ins and outs of double spikey rows and gentle 'Y' seams. This fun wall hanging always has that 'Wow' factor, no matter what colors you use! 'Inner Light' is probably the most popular workshop, as she makes up beautifully in any color family you choose! I am also a quilt show judge. One of my observations while judging is that many quilters can improve their projects by improving their binding skills. 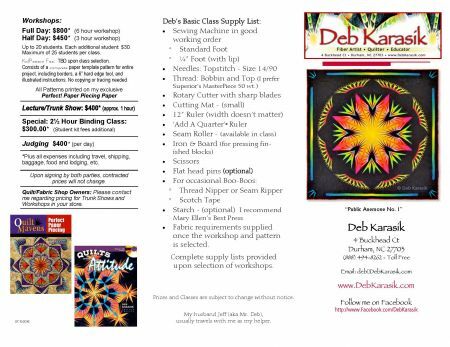 Like many of you, I was never offered a class focused on Quilt Bindings, and how they affect judging. What judges look at when they inspect a quilt's binding. 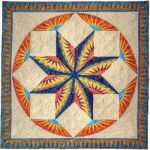 Why proper pressing of quilts and batting enhances how flat a quilt lays. How to easily join fabric strips to create the long binding strip. How to easily affix the binding strip using school glue and sewing. How to create perfectly mitered corners without bulk. How to easily 'close' the binding without using math, measuring, or special tools. This technique requires frequent pressing; I recommend a minimum of 1 iron for every 2 students. You should be sure that your classroom's electrical system has enough outlets and can accommodate the current draw. The class is about 2.5 hours in length and is suitable for all skill levels. I took the workshops the Mississippi Valley Guild hosted and you taught on your visit here to the Midwest (I think it was 2 years ago). I learned so much about paper piecing, but most of all binding. I use your binding technique all the time now. I had no judges comments on faulty binding at our big show in September this year. I took 6 first places with my quilts, so I guess I have finally arrived and eliminated many mistakes. Your binding technique was very important in the final quilts. Thank you so much. I will never forget the workshop and you! Click on "Find Out More..." link below to see more images and information.